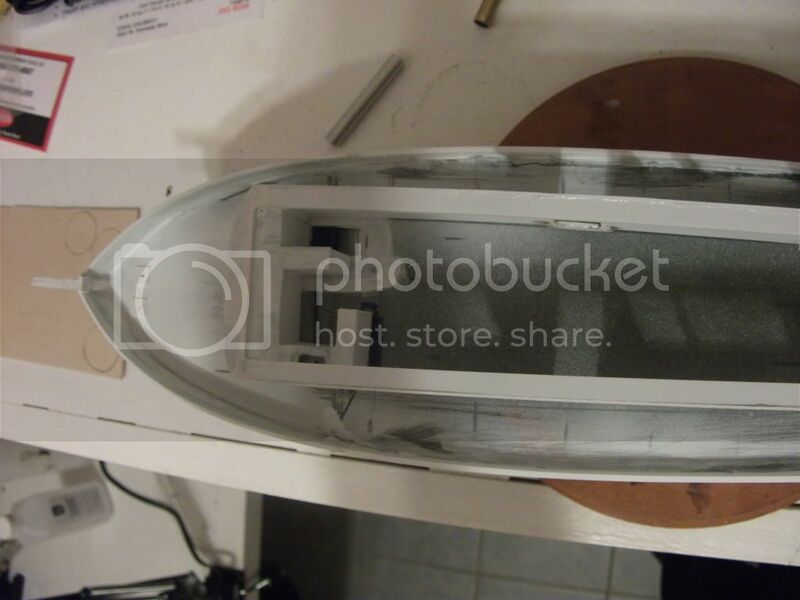 I've set up a blog for the PT BOAT SIG and its address is: http://ptblog-ptconsultingnhr.blogspot.com/2011/07/pt-boat-special-interest-group-blog.html. Please leave a post there ... but please, pay attention to the rules I set up, i.e. : no "mine is larger than yours" posts and no personal attacks. Thank you. 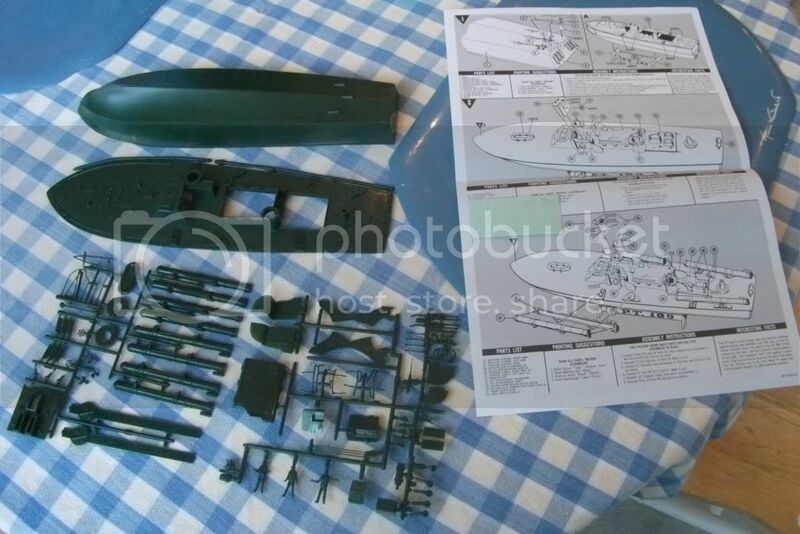 Building, Detailing, and Converting the 1:35 scale Italeri PT-596 will give the reader ideas, suggestions, inspiration and pointers for when they build this kit. A noted naval historian with input from four scale ship modelers (one of whom has won at the national level for his artisanship) put this monograph together and a noted researcher. It has color photos of five models based on the kit, accompanied by descriptions of what was done to achieve such high quality models. The book is also available on Barnes & Noble (www.bn.com). 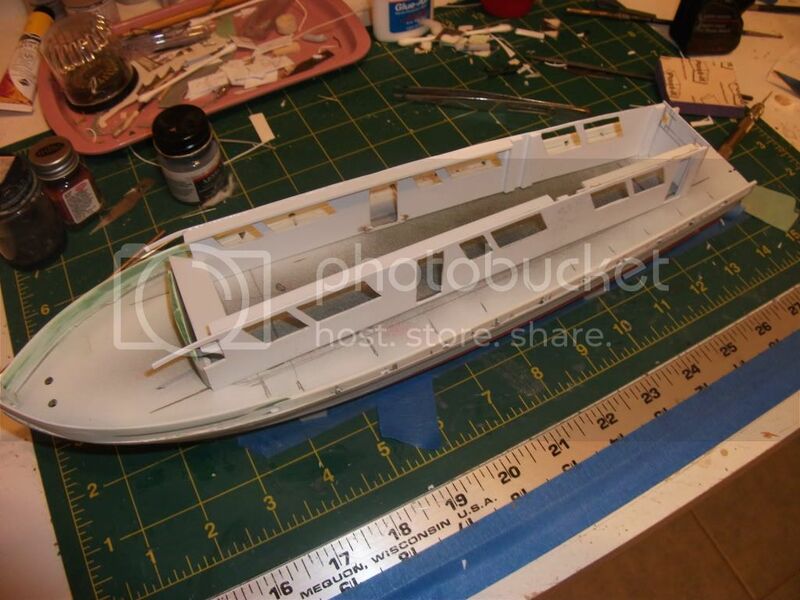 I will understand if this gets moved because it is not strictly a PT boat build. Some of this information came from Navsource, the rest from a crew member of America. Special thanks to Jack for all his help and stories provided of the America adventures sailing from Brooklyn NY. 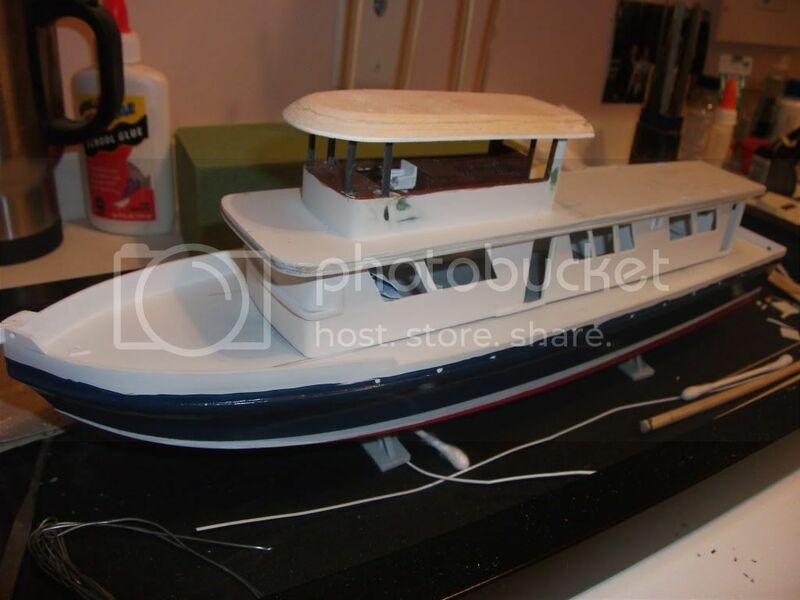 Re-engine to 4 Mercedes four cylinder blocks, galley forward in deck house, two heads one ladies and one men, aft live bait tank, wheel house set on observation deck. 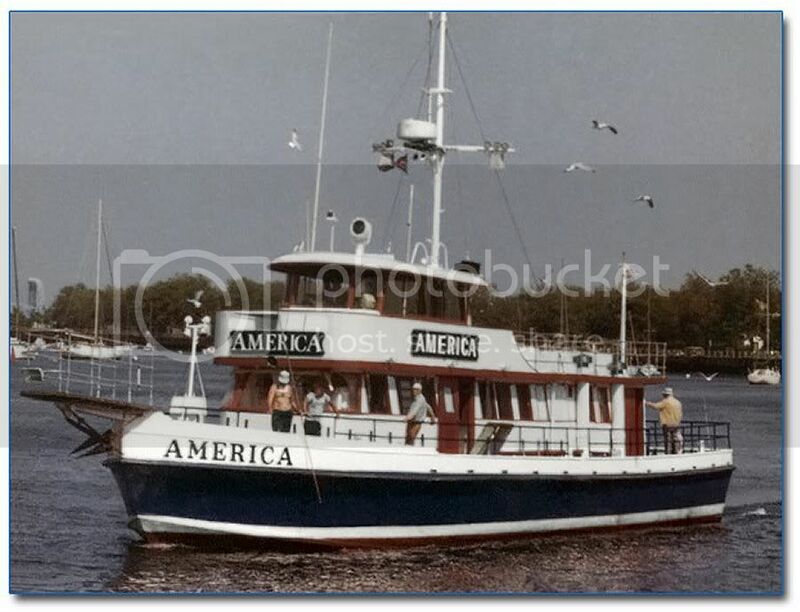 America was sold in 1984-85 after Capt Michaels was too ill to sail. It was renamed the Sea Star before it was sold to the Great lakes tour company. Sold to a Great Lakes tour company, late in the 1980’s or early 1990’s.lost after running on rocks. 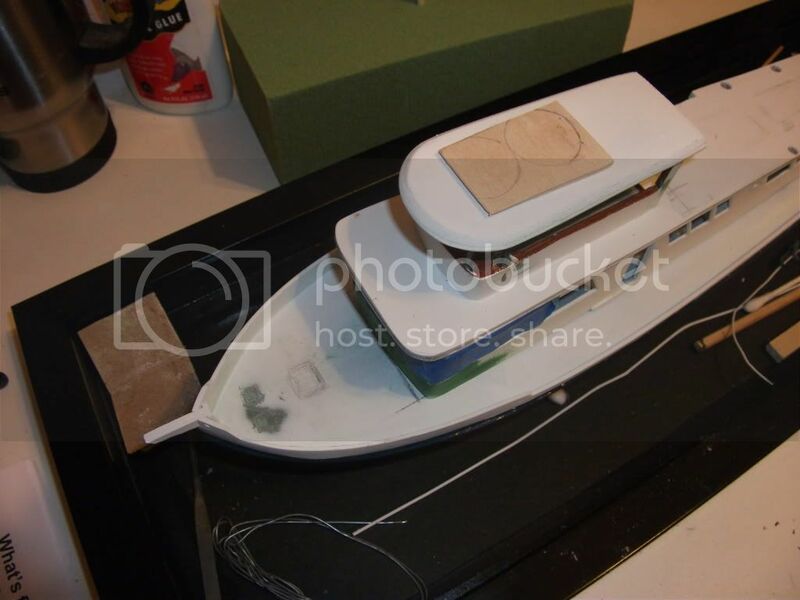 First step was tossing everything but the hull. New deck was made from plastic and fixed to the 109. I filled in the cut outs for the mufflers. 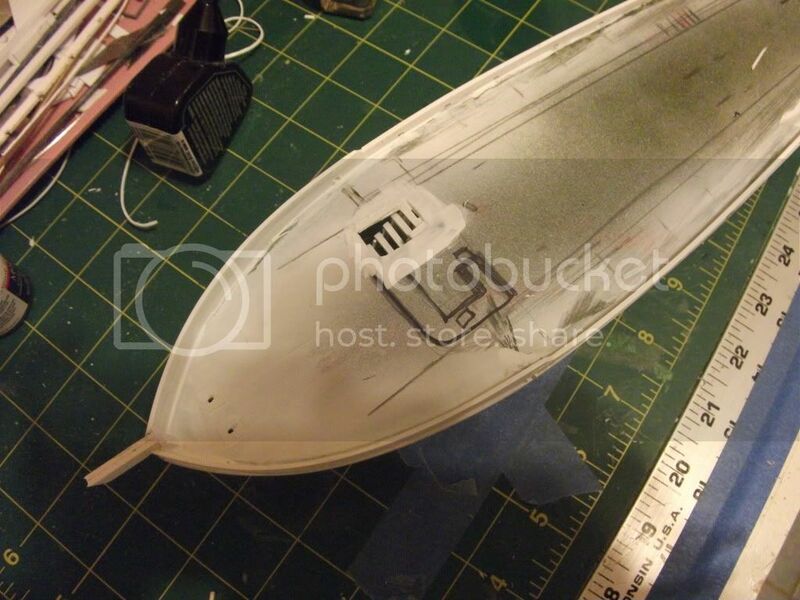 Note the kit says 1/72 but the hull measured out to 78 feet not 80. 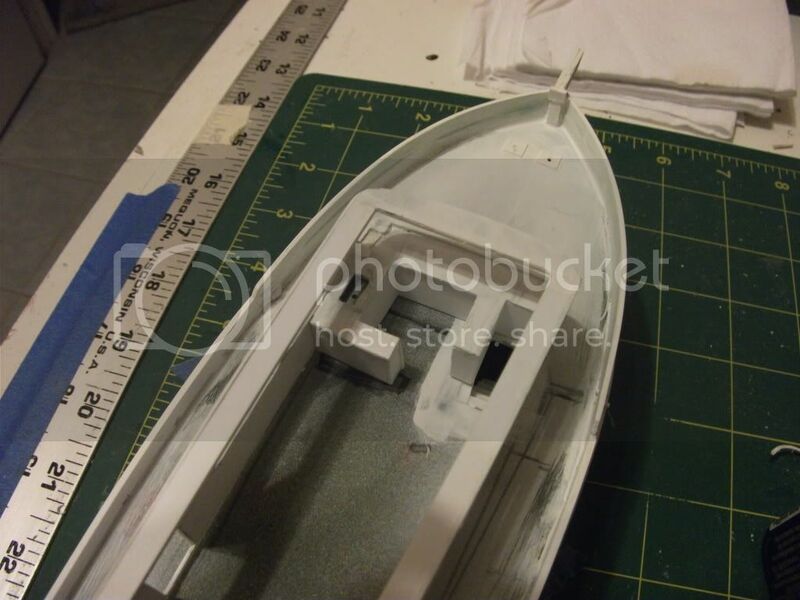 Two scale feet had to be added to the transom but I did not add any to the beam. Next step was building the frame of the deck house. Jack provided a drawing of the layout minus scale so the build will be based on MK1 eyeball from a couple of pictures and the general layout from Jack. I used the Jack Kennedy figure from the 109 kit as a guide and test to keep things in scale. 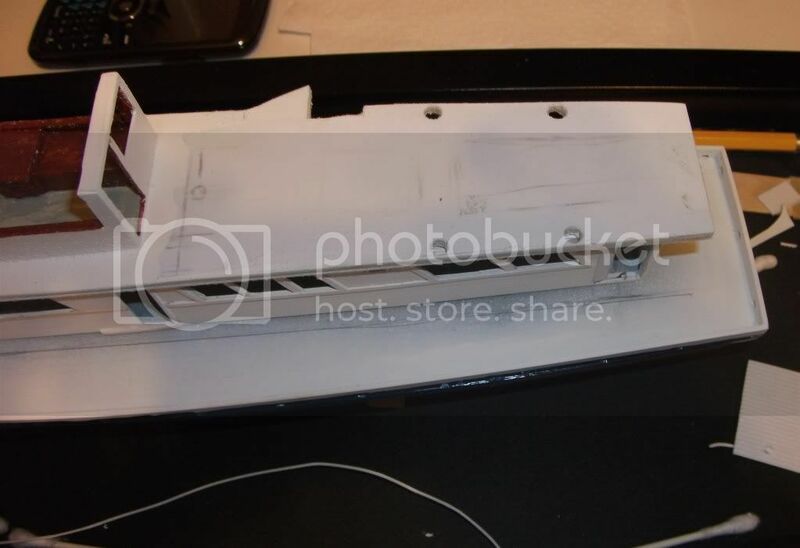 Sheet styrene, and various strips and rods from PLASTRUCT was used for most of the construction. 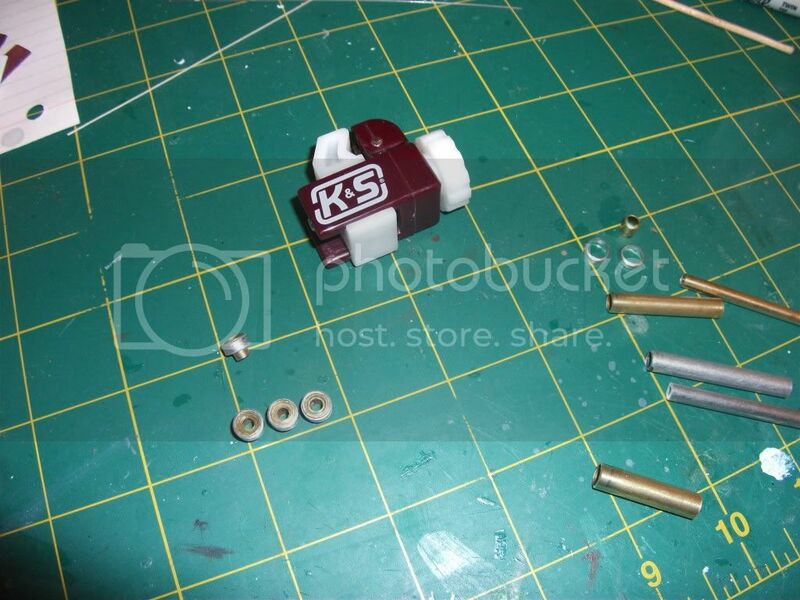 These pictures are the beginning of the build; I’ll add more as work is completed. I have till November club meet to complete for our group build. Forgot to add the picture used as inspiration. A few more thing completed, the stair case to the forcastel ad center fuel tank. Added the pulpit support on bow. 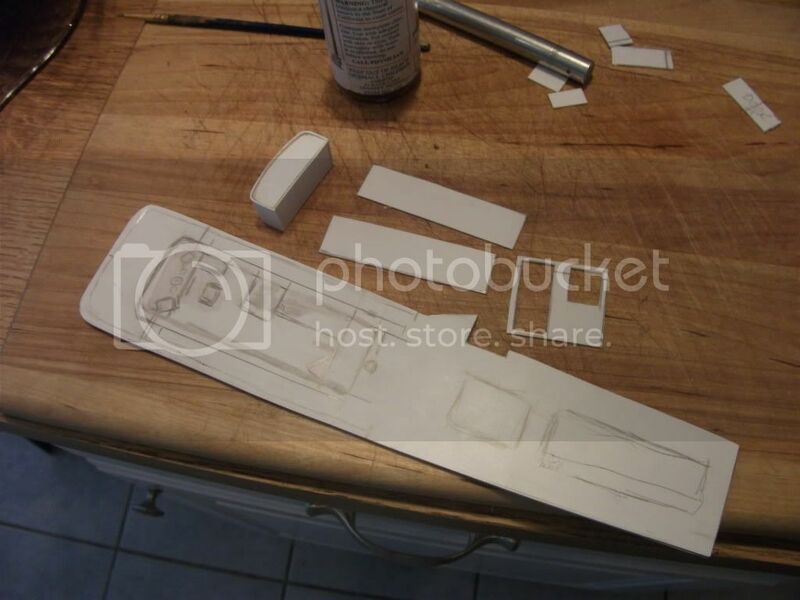 Next was the observation deck, I free hand drew the parts placement before cutting the plastic. Lots of measuring and cutting as I move forward. So far no kit parts used. 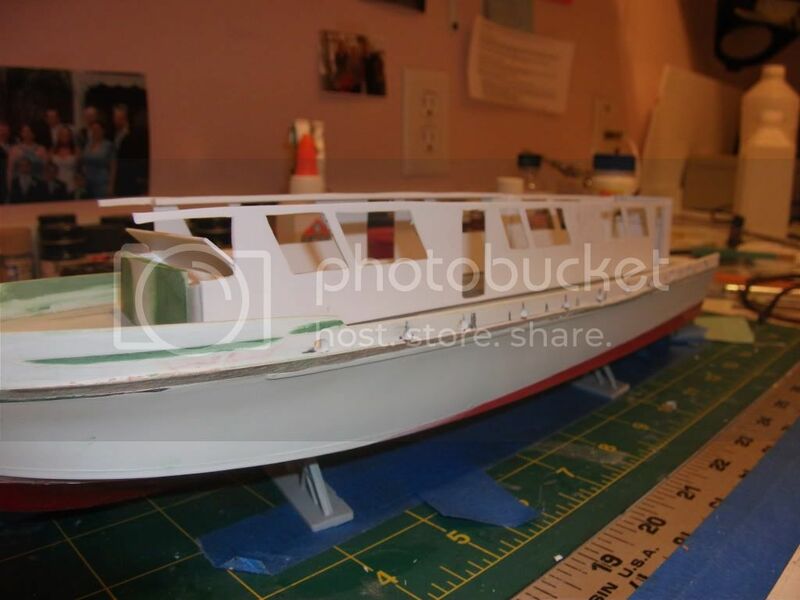 Test fit on hull, a bit more paint work to do on hull before I'm ready to mount any more parts. Hope you like it so far. I don't think it would have been possible without the help of the crew and friends of Capt Jackie. Sadly Capt Jackie is no longer with us but his friends all sent fond memories and stories that has helped keep the build moving along. I made the lexan windows today, the curved angle was interesting to say the least. 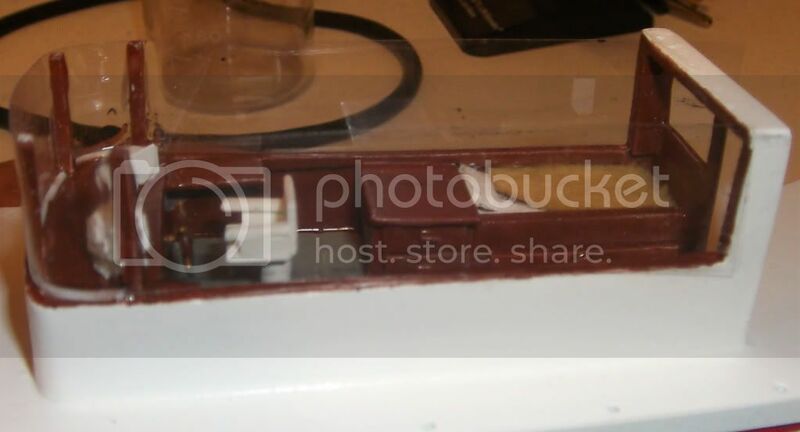 I used a block of wood formed to the shape, laid the plastic over it and heated with a Weller heat gun. I had to be very carefull not to melt the plastic. Now I'm getting down to the details so I hope to keep moving and still make the deadline. Here is a couple of pictures of the wood former used for curving the windshield and upper wheelhouse front wall. The broad end was cut angled back at the top then curved at each side. 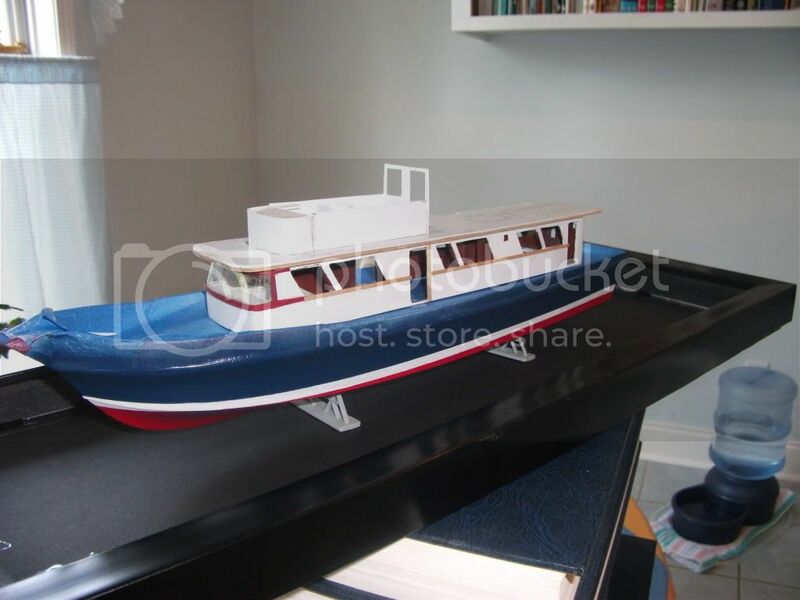 The rear part you see in the second picture was used to form the curved wheelhouse front wall. 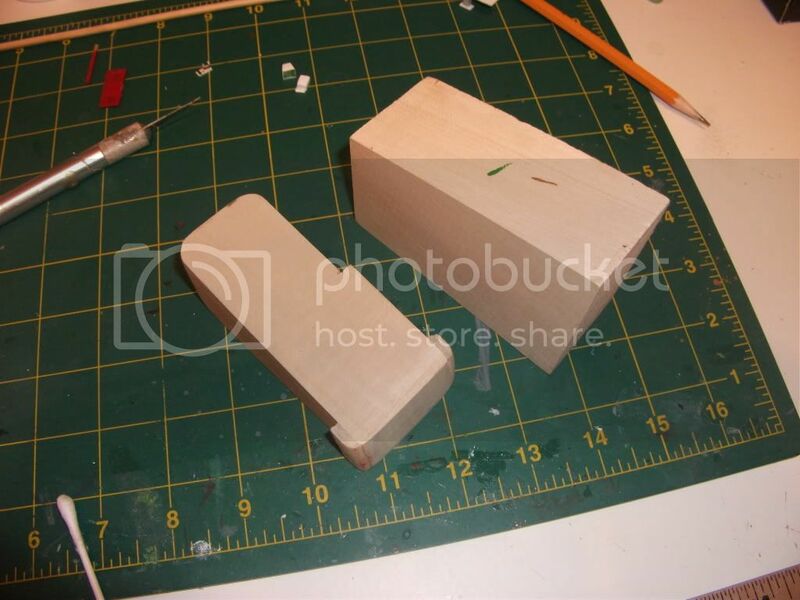 This was cut from a scrap wood stock you see on the right of the first picture. The wood was from Revell scrap stock bag. Behind the block (picture 1305) you see the rear main cabin door, radar screen and fish finder. They will soon be ready to mount in the wheelhouse. I'll post some more pictures later, oh and I found the perfect source for the engine intake stacks, large 12" long bamboo skewers, which I capped with segmented brass tubing to form the top vent cover. The mast was made from a medium size skewer with a small brass rod drilled through for the yard. Any feedback from the members here would be great thanks! 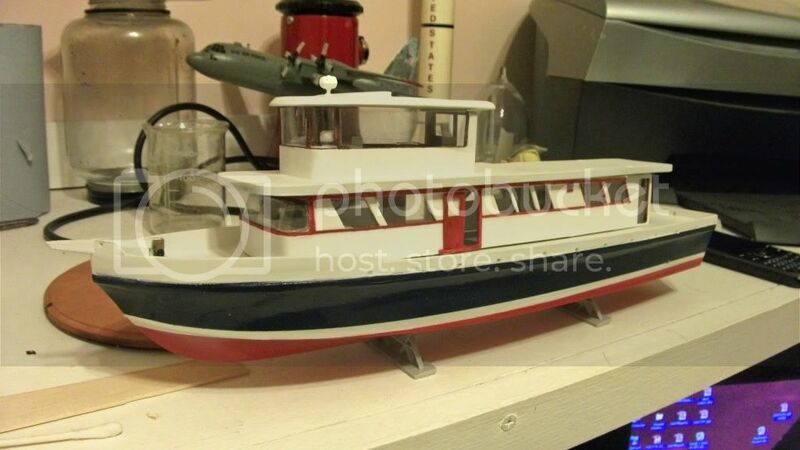 But, you actually knew the family who owned this boat? WOW! And to all of you who come to this page? Just remember that www.ptboatworld.com now has a blog that you can post comments and questions on. Please do so. Additionally, please remember that there is a new book out there named BUILDING, DETAILING AND CONVERTING THE 1:35 ITALERI PT-596, which is available through Chris Daley Publishing, www.amazon.com (and its European affliates) and www.bn.com . No not the family, a crew member from the boat. Without Jack's help this would not have been possible. 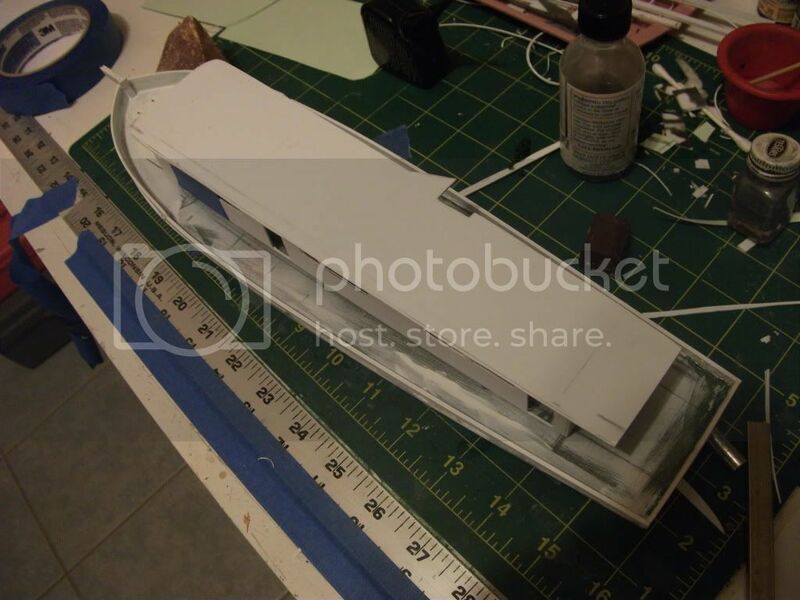 At this point I added another sheet of plastic to the observaion deck. 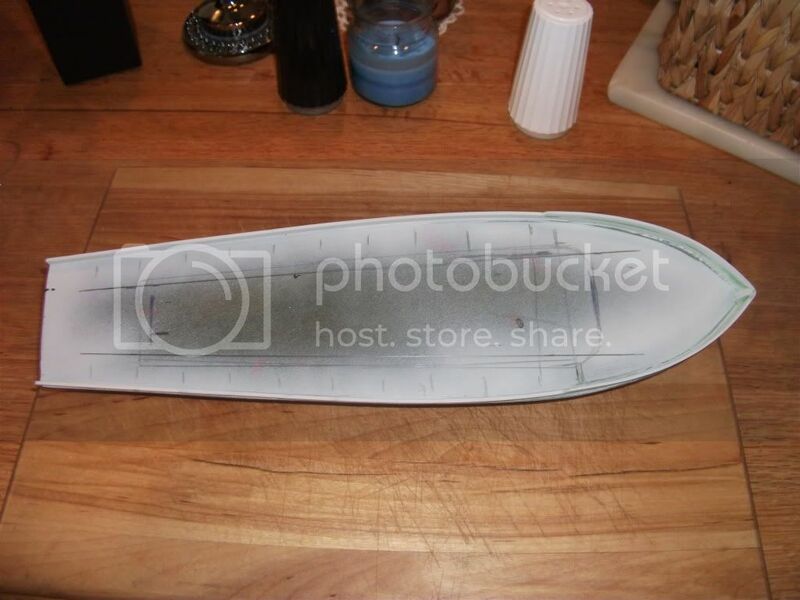 This made it scaled thickness to the real boat. Also note the rear cabin door has moved back a 1/4 inch. 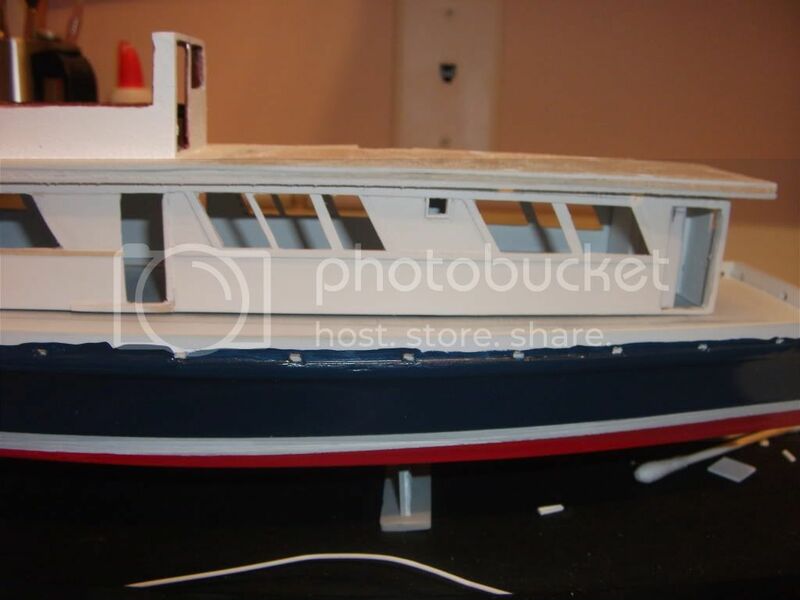 Now with the main cabin repainted and the top wheelhouse roof started. Here you can see the captains chair on the bridge. Well more changes and a minor setback with paint. Found out last night the bow sprit extended to the anchor wench about mid way from the bow to the deck house. Plus the wench was boxed over for a light tree which can be seen in the picture I posted. A bollard was next to the wench on each side and no ladder access to the pulpit. Jack said they had to climb up on the extended sprit to get up there. The paint problem started when I was clear coating the deck house. Too much to fast caused a big drip on the front wall now it's back to sanding and repaint the area before I can continue. Oh well will post more pic's when I have the additional work complete. Work on the wheel house roof, the wood part on top is still not attached while I get clarification on size and shape. The location of the anchor wench is marked in pensile again waiting to confirm location from Jack my source for this build. added the new trim plus glass on deck house. 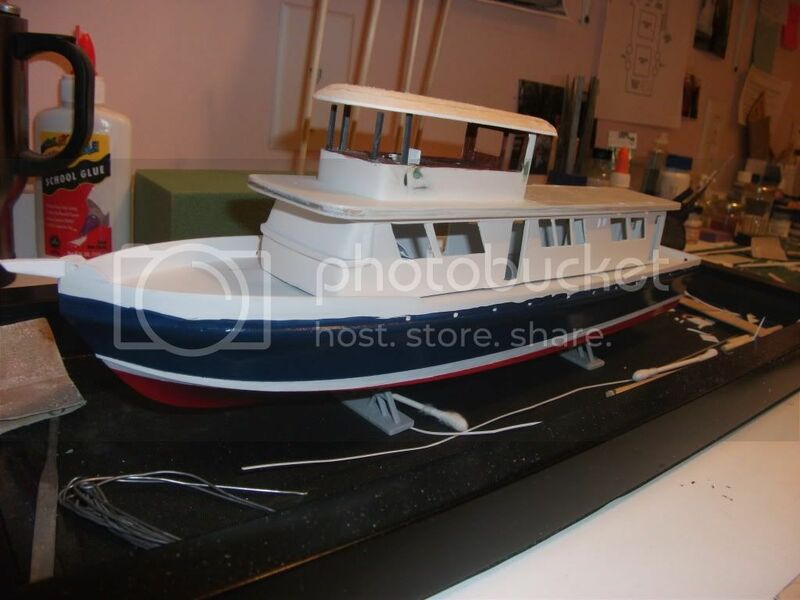 Finished the roof with added search light plus almost finished with wheelhouse. 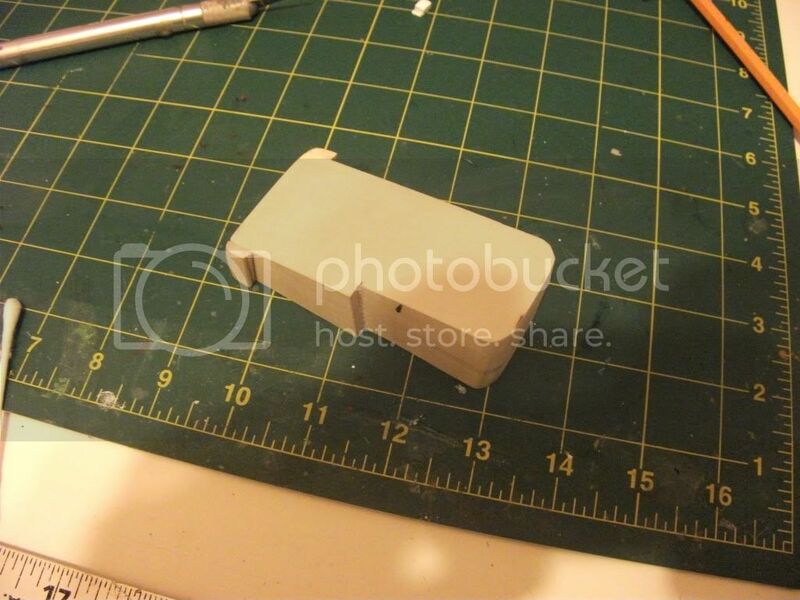 I spent most of the week building the big parts, now it's time to get the details down and start the finial phase. Thanks for looking and any comments welcome. That was the 314, right Art? Yes PT 314 was sold in 1961 to Jackie Michaels. He converted her to a fishing boat. This build is the last known configuration. Thanks. 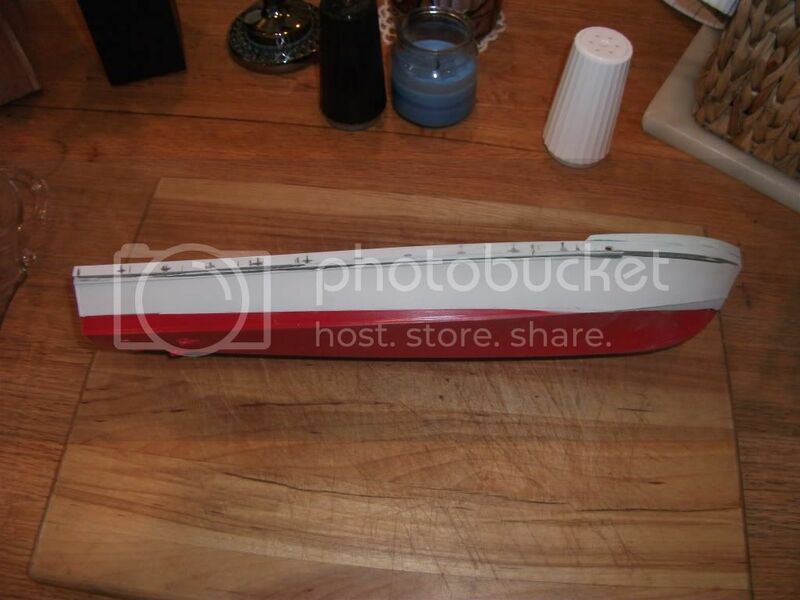 I've seen a color photo of the boat as thte 314, at the MTBSTC in Melville, RI. Did you happen to get a copy? Yes, ... but I'm out on Cape Cod ... I don't have that photo on this computer. Just a reminder: The new book Building, Detailing, and Converting the 1: 35 Scale Italeri PT-596 is available via Amazon.com. The United States Navy Patrol Torpedo Boats book and the MAS Boat book is also in eBook format. They'll make GREAT Christmas gifts!!!!!!!!!!!!!!!!!!!!!!!!!!!!! !